Calista's ears were pierced today. Now I have three girls with earrings. The desire to get their ears pierced was very strong, though with Aïcha I had to work hard to talk David around to the idea. I was seven years old when I finally convinced my mum to let me get my ears pierced. We were back in Australia for a couple weeks in December 1984, and I was desperate to get them done. Back “home” in Niger, the Africans thought I was a boy. I was living in a culture that primarily distinguished the gender of children by the holes, or lack thereof, in the ears. All girls — and I really do mean all — had their ears pierced. Girls from poor families sometimes only had a piece of straw or thread keeping the hole open, and some women didn’t wear earrings, but the holes remained for all to see. The length of my very straight hair didn’t distinguish me as a girl. The Nigeriens weren’t yet as familiar with Western people through media such as television, and they didn’t see hair as a feature of gender. Even when I wore a dress, I was mistaken for a boy. It definitely didn’t help that until I went off to boarding school in Nigeria, I often got around the Bible School compound wearing just shorts. After all, that’s all the African kids wore — but the girls wore earrings too. So when we went past a chemist in Armidale where ear-piercing was advertised, I begged and begged. My mother’s mind must have already been made up (or was it just the conclusion from a long, drawn-out, late-night discussion with my dad? ), as she and my two sisters also got their ears pierced at the same time. I realise that the culture we currently live in doesn’t distinguish between boys and girls in the same way. However, I do, and it’s part of who I am and who I choose to pass on my girls. Other people may decide to wait and let their daughter request to have her ears pierced, but I prefer to do it to my daughters when they’re still young babies. 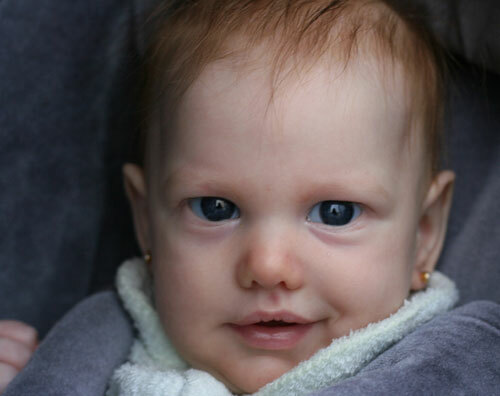 At this age, Calista hasn’t yet “found” her ears and can’t “worry” the new earrings — increasing the risk of infection. Also, she is easily placated with a quick breastfeed after the earrings are in. She’ll never remember the pain, and she certainly doesn’t know enough to baulk after only one ear is done. And I think it looks pretty! Looking at this photo of Calista, do you agree? Isn’t that funny? Its the first thing I did too. I actually waited till 6 months, at the request of our doctor, and it drove me crazy until it was finally done. I was 6 too, when I had mine done, and everybody thought I was a boy, and I hated it. So now my girls have pretty earings. Thanks, Anne, for commenting. It reassures me that I may be normal — or are we just anomalies in our Western cultures? I think the practice of piercing the ears of a baby or young child (that is, someone who can’t understand or consent), is one of the most selfish, abusive things I can think of. So unnecessary. I’m sorry but I have to agree with Wendy….I don’t know how anyone can punch holes through their baby’s ear without consent, especially as it’s completely unnecessary. I think waiting until they ask is the right thing to do. To me this goes against all of your principles that I have so much respect for, Lauren.